I am a Las Vegas resident. I’ve called the city my home for ten-plus years and pretty much seen and done it all. Quite frankly it’s just another city to me at this point. The one unique thing about this city that you can’t find anywhere else in this country is legal sports handicapping. 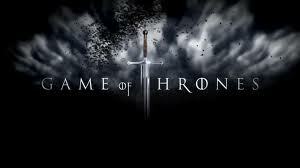 Sure you can login to the numerous overseas accounts and place your wagers…. Bodog comes to mind. That is all well and good until your account gets locked or they delay your payment for months. In fact, ninety BILLION Dollars was wagered this year on the Super Bowl alone while roughly just ninety-five million came from within our country’s borders. This isn’t a post about the legalization of sports betting in the US. Its more about the enjoyment of a bet and its ties to sports. This starts when we are kids. An argument begins and there is only one way to handle it. BET ME! This was the ultimate put your money where your mouth is proposition and an instant way to settle an argument. Watching your team lose and having to go to school the next day to fork over the five bucks was always miserable. On the other hand being able to say, “I told you so” when your team won and getting paid was very fulfilling. Growing up this was just the way it was. No point spreads. No teasers. No parlays. 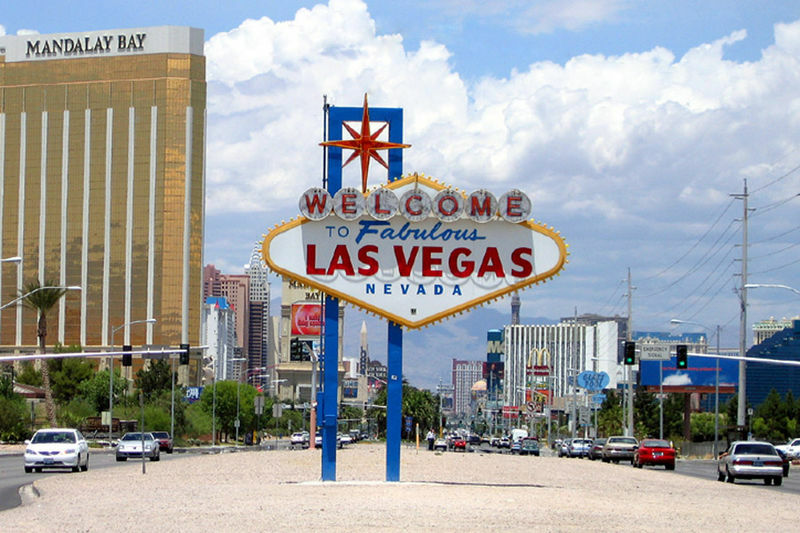 When I got to Las Vegas everything changed. Of course I was always aware of the “betting line” and who was favored growing up. None of that mattered as a kid though. I’ll never forget my first bet. I had it all figured out. I ‘d watched sports all my life. This was going to be easy for me. The Patriots were coming off of their first Super Bowl victory over the Rams. They were hosting Pittsburgh. I believe the Steelers were a three-point favorite. New England was a fluke in my mind. 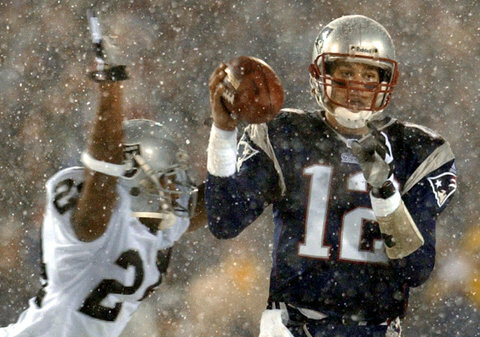 They beat the Raiders because of the tuck rule. They went on to shock Pittsburgh in the AFC title game, then pulled off one of the biggest upsets in Super Bowl history. They didn’t have staying power. At least that was my thinking. I laid my sixty dollars down on the game to win roughly fifty-five dollars because of the “juice” that I didn’t know existed. The juice is how casinos make their money on sports (more on that later). The game was never close. The Pats controlled the game from start to finish. I was out sixty bucks. From that point on the defending Super Bowl champs won every season opener they appeared in until this past season when the Giants lost. What a way to start. Betting lines are not set because the “books” think a team will win by X amount of points. They are set to create equal action on both sides. This allows the books to rack up on the “juice”. For example you must bet $1.10 to win one dollar no matter which side you’re on. 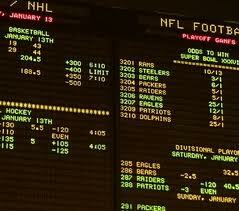 Teams like the Cowboys, Lakers and Steelers always have inflated lines because sports books know money will always come in on teams with large fan bases. I’ve suffered many bad beats over the years that I will never forget. They really never leave you. Every poker player knows the term “bad beat”. The term applies to sports as well. 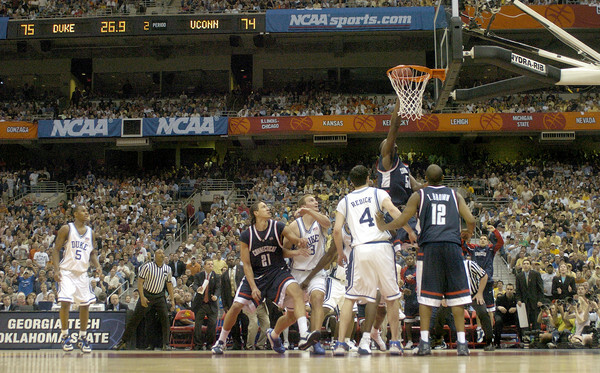 The one that always comes to mind is the 2004 national semifinal between Duke and UConn. UConn was a 2.5-point favorite. They trailed by as much as eight with under 4 minutes to go. UConn closed on a 14-0 run to take a 4 point lead after an Emeka Okafor free throw. Duke’s Chris Duhon hit a three-point shot from about halfcourt as the buzzer sounded Giving UConn a one-point win. This shot was meaningless to most. It wasn’t meaningless to the couple hundred people at the sports book that had money on the game. The place erupted. Some were mad, others glad. All impacted by a seemingly meaningless shot. Nothing is worse than the meaningless TD that causes a game to go “over” the total which results in a “backdoor” cover. The hoops team that decides to foul down ten points with under ten seconds left when two more points is the difference between you winning and losing your bet. The “U” throwing a pick 6 against Maryland on Labor Day weekend busting the cover as they were trying to go in for the winning score. My only thought was, “anything but a pick 6”. These are the moments that drive you crazy. The flip side is NOTHING equals betting on your team to win in a big game and watching them come through. This was the case in January of 2006 when Texas faced USC in the Rose Bowl for the National Title. The Horns were huge underdogs. No one besides the inhabitants of Austin and ESPN College Gameday analyst Lee Corso gave them a chance. To this day I’ve never bet more on a game. As I watched the closing minutes, the money didn’t matter at all. I was like a kid again. Money was on the line but I was simply a fan. I just wanted to rub it in the faces of everyone who said my Horns couldn’t do it. I just wanted to be able to say “I Told You So”. 44 times Floyd Mayweather has stepped into a boxing ring, 44 times he has left a winner. 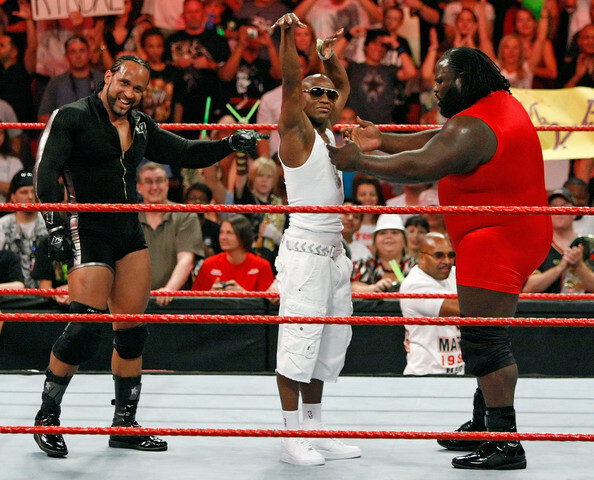 Think back on all of Mayweather’s victories. Now try to remember a time there was any doubt as the judges’ scorecards were read after the 12th round. Mayweather has dominated a sport riddled with corruption and scandal. He has managed to maximize his earnings every single time he puts on the gloves. Mayweather promotes himself. No need for an Arum or a Don King in Floyd’s camp. He handles his business in the ring and out. I’ll admit, I am no expert when it comes to the sport of boxing. I have never followed the sport with a watchful eye hoping to catch a glimpse of the next “Great American Boxer”. Over the years I’ve paid more attention to the “mega super cards” than the Friday Night Fights card on ESPN. I’m a main event type of guy. I’ve watched the main events long enough to know a good one when I see it. Now that we all know where I stand when it comes to boxing, allow me to explain why I have never, and might not ever root for Floyd Mayweather. I could point to his actions away from the ring. The spousal abuse, the constant need to hear his own voice or the jagged relationship with his father. Lets not forget his short stint in the world of professional wrestling. All reasons enough to dislike Mayweather. He seems like a terrible guy outside the ring, but what he does there has no bearing on my wallet. When I decide to pony up the outrageous amount of money it costs to watch a pay-per-view, none of the “terrible guy” things are considered in my decision to buy the fight. I look at Mayweather’s opponent. 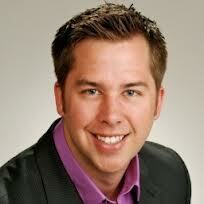 My question isn’t whether the guy fighting Mayweather can win, it’s can this guy make it interesting? 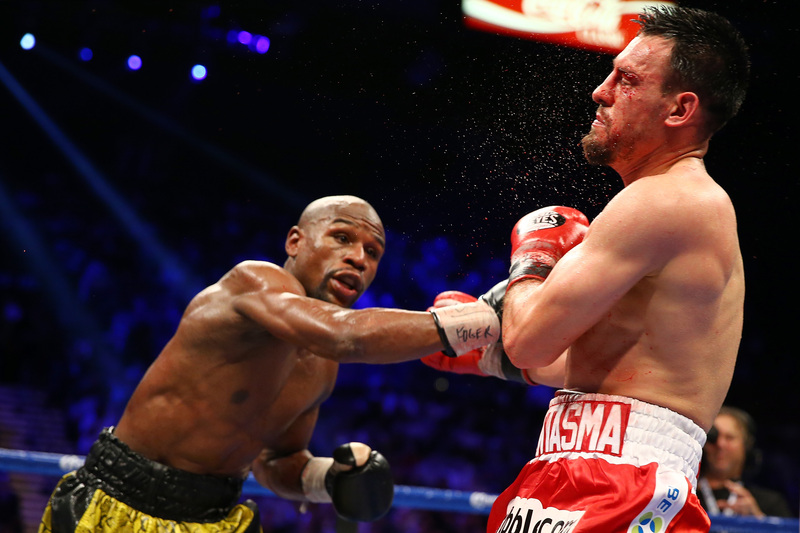 Floyd Mayweather is such a dominant BOXER, his fights tend to swing to the boring side. He hits and avoids being hit. It’s the definition of the “sweet science”. He executes his game plan without ever having to adjust. Mayweather can score at will. He has knockout power, yet it seems he gets more satisfaction out of outpointing his opponents for twelve rounds. Opponents have that hours away from retirement look on their faces as they wait to hear if the judges felt Mayweather pitched a shut out. Simply put, Floyd Mayweather might be too good for my money. Usually an absolutely dominating sports figure is a must see. It’s entirely the opposite when it comes to Floyd. Why spend the money if we know he is going to cruise to a decision victory? Why pony up if we know Floyd’s opponent stands no chance? I saved 65 dollars Saturday night. Floyd’s fight went exactly like I thought it would. I have yet to see a highlight. Reading articles on the fight tell me all I need to know. 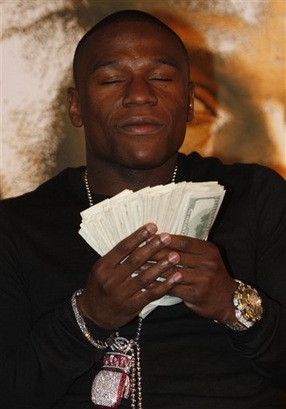 Floyd Mayweather’s greatness means I have sixty-five more dollars to spend on my wife for Mother’s Day. Despite his greatness I can’t root for Mayweather. Mayweather is just too good. He is just too good. I can’t stand him for that.